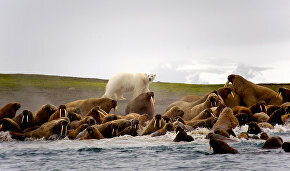 Studying the fauna of the Arctic has been and remains an important factor in the region’s development. Arctic.ru discussed with ornithologist and biogeographer Pyotr Glazov how bird population research is conducted and what role bird habitats and changes in their distribution play in traditional use of natural resources by the indigenous peoples of the north. Pyotr, tell us about your routine work. I study goose species, their breeding sites, wintering ranges and migratory routes. To be more precise, I study the effect of various factors (climate change, changing habitat conditions) on bird habitats and also how bird species population dynamics influence ecosystems in general. You evaluate waterfowl resources and how they are used. What are those resources? Have they changed much lately? The problem is that most waterfowl are hunting species. People in our country and other countries hunt them throughout the entire length of their migratory routes. In order to calculate the shooting limits, it's necessary to monitor the population of a species, its condition, and then take the appropriate steps, for example, recommend adding a species into the Red Book or ban hunting or create specially protected areas for endangered species. Are those just one-year surveys or is a much longer time frame needed before any recommendations can be worked out? It's a big job that requires an international effort. Many experts contribute to this study because it's necessary to conduct bird counts in different parts of a habitat and at wintering grounds as well. Several countries cooperate to conduct these counts. And what are the countries? That depends on the species and its habitat. Geese that breed in the north of the European part of Russia migrate mostly to Western Europe, so we team up with our European colleagues. And in Russia, the scale of this work depends on how much money is allocated for it. These are very costly projects. Your institute says on its website that you participate in monitoring the traditional use of natural resources by the indigenous peoples of the north. What kind of monitoring is that? How is it conducted and what purpose does it serve? Those are mostly associated projects. 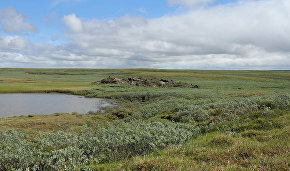 For instance, we conducted research on Kolguyev and Vaygach islands, where we study birds. Geese somehow shape traditional resource management: locals hunt them and gather goose eggs. Geese are a significant resource for peoples of the north. That's why it's important to know how changing habitats and bird populations influence their traditional use of natural resources, and the other way round, how people influence birds. We conduct polls among locals, and see if their way of life changes along with the environment. We see how the fauna changes in some area or another and how it influences the locals. Suppose your poll reveals that locals have an adverse effect on birds. Can you ban them from hunting? We have no authority to ban anything, but we can recommend where they can hunt and where (or during what time of the year) they shouldn't disturb birds. Our recommendations are optional for communities and local authorities. We may urge local officials to create specially protected natural areas, change hunting schedules or suspend hunting. Do the local authorities heed your advice? It's a long process. Lots of documents have to be prepared. Sometimes mining companies show interest in an area. Their purpose is to extract mineral resources. Our purpose is to find a compromise. You have taken part in Arctic research expeditions. What results did you receive? We constantly participate in expeditions. 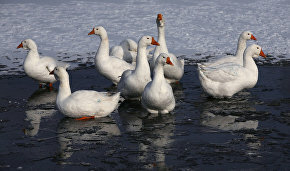 Geese mainly breed in the Arctic, in the tundra. To assess the condition of a bird species, it's first necessary to study its breeding areas and how successfully it breeds, study the biology and the geography of the species. That's why we come to the Arctic every year and monitor bird populations. Successful breeding depends on various factors, for example, whether the spring was early or late or what the summer was like. It helps us conclude how birds feel, how many hatchlings they'll raise, how they will fly to their winter grounds and how many birds will be there.